MANILA, Philippines — The newest reality contest in town, ABS-CBN’s World of Dance Philippines has drawn 20 dance acts from here and overseas, all qualified to spin, sway and swing their way to the next round. 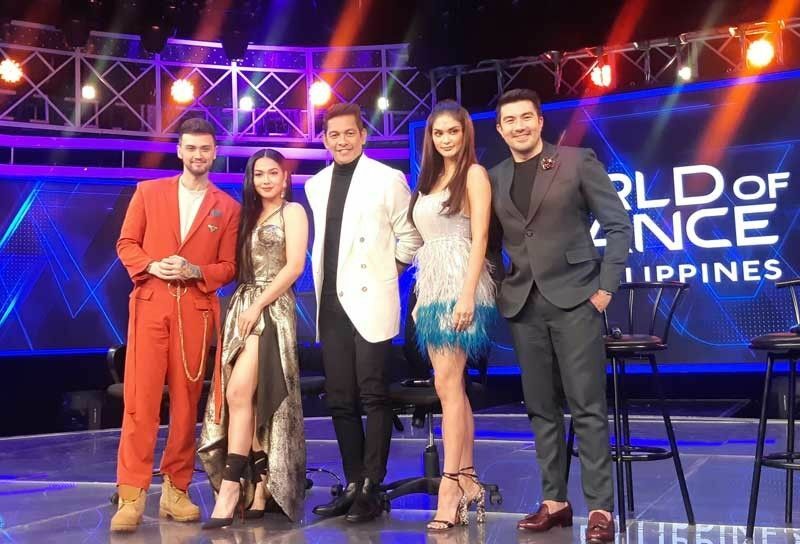 Various dance styles and back-stories were shown to audiences, judges Gary Valenciano, Billy Crawford and Maja Salvador, as well as hosts Pia Wurtzbach and Luis Manzano. A hip-hop artist once performed with Billy. A ballroom dancer studied the art because of Maja. An urban dance group caught Gary V’s eye for its “winning” name. During a presscon on Wednesday, it was the turn of the judges of the Philippine edition of the US dance show to open up on their own long love affair with dance and performance. The 54-year-old Gary, who earned the showbiz moniker Mr. Pure Energy, was inspired early on by foreign artists like Michael Jackson, Sammy Davis Jr. and James Brown. “After I would see them (on TV), I would look for a place where I could practice. As a matter of fact, when I became part of Kundirana (the music ministry of La Salle Greenhills) in high school, habang kumakain ang ibang kaklase ko sa may Unimart after dismissal, I would be in the music room. I would practice in front of this big mirror, doing the moonwalk. I didn’t think I was already doing it right because for me, mali pa rin. Until my classmates said, ‘That’s what Michael Jackson is doing.’ Then they would tell me, magsayaw ka pa (dance some more),” Gary recalled. For Billy, it was Gary V who introduced him to the performing world. “This is the reason (pointing at Gary) I got into dancing. That’s being honest. And he knows this,” the 36-year-old singer/host shared. Maja, on the other hand, loved watching TV shows as a kid because “gusto kong panoorin yung mga lalaking tuma-tumbling — the Streetboys. Until (former Miss Universe) Ms. Dayanara Torres became my idol because of course (I’d see her) in ASAP, then Ms. Vanessa del Bianco (who has since quit showbiz).” She laughingly recalled that she once shared a dance number with the latter and she became so afraid of committing mistakes that to avoid making any, she loudly counted her steps and it was caught on cam. But Gary, who has long worked with Maja in the Sunday variety show ASAP, begged to disagree with Maja’s self-confessed shyness. Meanwhile, Luis and Pia didn’t need to showcase some dancing skills, hidden or otherwise, to be chosen as hosts. “(World of Dance) is already established in the different parts of the world, especially in the US. So, it’s really a big deal for me (to be host). I’m still new to hosting, it’s something I’m trying to get used to but they like my personality. And you know, I work closely with the contestants. So far, I’ve been having a lot of fun here, learning a lot and slowly getting better at hosting,” the 2015 Miss Universe said. “But you realize early on that I love dancing but it won’t be my bread and butter. I was so interested but I wasn’t able to turn it into a passion per se,” he added. Luis has been the go-to host for nearly every new reality show on ABS-CBN. How many shows has he done so far? “Good question. I wish I knew. It’s a good problem to have. I simply started in MYX then ASAP, then the shows came one after another. The sum total — how many shows and the number of seasons — I honestly don’t have any idea. But thank you, I’m going to look into that,” the host told The STAR. World of Dance Philippines airs Saturdays and Sundays, 7:30 p.m.